I've always have problems when it comes to my teeth. I've gone through all procedures from just a minor tooth filling cause of decay to root treatment to crowning to tooth extraction (both milk tooth and grown tooth-Wisdom Tooth). If you ask me whether I'm afraid visiting the dental clinic? No, of cos' not. Just that sometimes I'm just sick and tired of all these problems and procedures I have to go through, thanks to my problematic weak teeth. Yes, I've always taken care of my teeth (We all have to, isn't it?). No, I don't skip brushing my teeth every morning and night. What it is to blame then? =____= Btw, I'm already used to it. Been having this very very torturing problem of gums infection that causes my whole entire left mouth and sometimes even my neck to swell. I won't be able to open nor close my jaw, I can't talk much nor even eat. This is real hell for someone who just ADORES food! And this problems come visiting me every single month ever since July 08', just like my period la. Never thought that teeth can be so "Touchy", in other words "Emo". 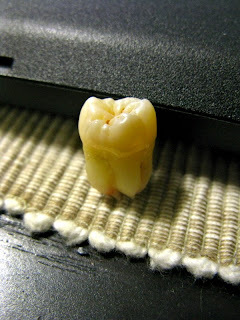 Hmm, your wisdom tooth came out early. good good..now be a bo geh cutie! eh... who say boh geh. I somemore got weird geh extra "geh" ok ... haih.. I need to scan the X-ray and highlight it to blog. then you guys will understand what do I mean by "weird". LOL.